Panduan permohonan dan maklumat terperinci mengenai jawatan di atas serta syarat-syarat kelayakan boleh diperolehi melalui laman web tersebut. The idea to establish an Islamic institution of higher learning as a Public Institution of Higher Learning(IPTA) is the government's effort to meet the shortage of intellectuals who master Islamic knowledge.Announcement of the initial proposal was made by the Minister of Education at that time, Yang Berhormat Datuk Seri Najib Tun Razak in Pasir Puteh, Kelantan, on June 14, 1996. Official announcement of the establishment of Islamic University College of Malaysia was made by Yang Berhormat Datuk Seri Najib Tun Razak on June 14, 1997, in Besut, Terengganu, after the approval fromthe Cabinet on June 11, 1997. The establishment of KUIM also provides an opportunity for graduates from the State Islamic Secondary Schools (SMAN), the Private Islamic Secondary Schools (SMAR) and the Ministry’s National Islamic Secondary School (SMKA) to further their Islamic studies without having to go to West Asia. This measure will reduce the government's burden in sending students to pursue their studies abroad. The Government aims to have a center of intellectual excellence to produce Islamic scholars. 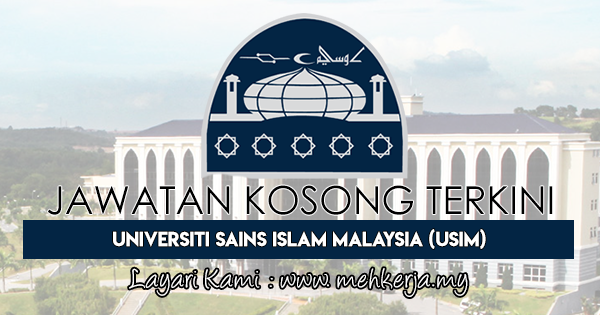 0 Response to "Jawatan Kosong Terkini di Universiti Sains Islam Malaysia (USIM) - 9 April 2018"